We strongly condemn continuous arson the villages of indigenous Jumma peoples and minority ethnic houses in Chittagong Hill Tracts (CHTs), Bangladesh (BD). 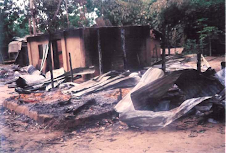 Local sources said on March 5, 2010, the illegal Bengali Muslim settlers backed by Bangladesh (BD) army personnel burnt down at least six more houses and a UNICEF-run community school in Sajek Union of Rangamati hill district in CHTs. Similar arson attack carried out there on February 19-20 and subsequent violence that has spread to Khagrachari town and other areas. Over 400 homes of indigenous people as well as several shops, a church, 2 Buddhist temples and a UNDP-run village center have been burned down in Gangaram Mukh, Guchchagram, Hazachhara, Jaralchhari, Dane Gulakmachhara, Bame Gulakmachhara, Simanachhara, Chhurung Nala and Gulakmacchara villages. At least two indigenous Jumma people have been shot dead by army personnel, and dozens have been injured in the incident. We demand that the government of Bangladesh to immediate and unrestricted access to massacre sites. The government of Bangladesh has so far denied access to the sites. We also demand the intervention of UN and USA for permanent peace in the CHT. Though the “CHT Peace Accord’ 97 ” signed between the Govt. 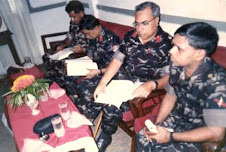 of Bangladesh and the Parbatya Chattyagram Jana Sanghati Samity (an arms resistance group of the local people in CHT) in December 2, 1997 where the demand of indigenous Jumma people’s haven’t reached and the Accord is not implemented after a decade. Since 1980 there have been carried out about 14 major instances of massacre of the Jummas by the illegal Bengali Muslim settlers and in co-operation with the law enforce agencies of Bangladesh that have to be brought into justice. In March 25, 1980 Kaukhali-Kalampati Massacre where Bangladesh Army and the Bengali Muslim settlers gunned down 300 Jummas. Banraibari-Beltali-Belchari Massacre, June 26, 1981: - settlers under the protection of the BD Army, murdered hundreds of Jummas. Telafang-Ashalong-Tabalchari Massacre, September 19, 1981: - The BD Army and the Bengali settlers invaded the Jumma villages of Feni valley and murdered hundreds of Jummas. 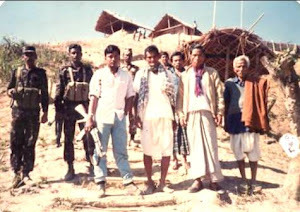 Golakpatimachara -Machyachara -Tarabanchari Massacre, June-August 1983: - The BD Army and the settlers executed month’s long campaign against the Jumma villages and murdered 800 Jummas. Bhusanchara Massacre, May 31, 1984 - the massacre was carried out jointly by the 26 Bengal Regiment of the Bangladesh Army and the Bangladeshi settlers. At least 400 Jummas were killed. Many women were gang raped and later shot dead. 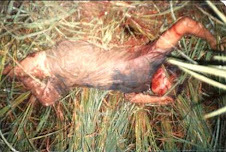 Panchari Massacre, May 1, 1986 : - hundreds of Jummas (actual number not known) were killed and injured by the Bangladesh Army. 80,000 Jummas fled across the border to India. Matiranga Massacre, May 1986 - The Bangladesh Army gunned down at least 70 Jumma civilians in reprisal to fighting with the Shanti Bahini. 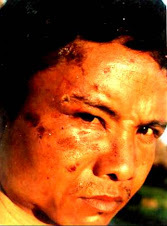 Comillatilla, Taindong Massacre, May 18-19, 1986:- the Bangladesh Rifles (a paramilitary force) intercepted 200 Jummas while fleeing across the border to India and opened fired on them. Hirarchar, Sarbotali, Khagrachari, Pablakhali Massacres, August 8-10, 1988:- The Bangladesh Army along with the Bangladeshi settlers killed hundreds of Jumma civilians and gang raped Jumma women. Langadu Massacre, May 4, 1989:- the Bangladeshi settlers murdered 40 Jummas, dead bodies never recovered. Malya Massacre, February 2, 1992:- the Bangladeshi settlers murdered another 30 Jummas. 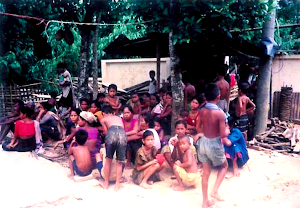 Logang Massacre, April 10, 1992:- the Logang Cluster village burnt into ashes and 1200 Jummas killed by the Bangladeshi military and the Muslim settlers. Naniachar Massacre, November 17, 1993:- about 100 Jummas killed by the Bangladeshi Muslim settlers. Mahalchari Massacre, August 26, 2003:- about 14 villages burnt into ashes at least 2 killed and hundred Jumma injured. 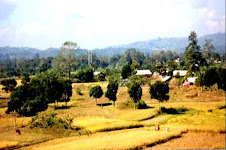 On 19-20 February 2010 massive communal attack on Jumma villages was made by military forces and Bengali Muslim settlers at Baghaihat area of Sajek union under Baghaichari upazila in Rangamati hill district. It is reported that at 8 innocent Jumma villagers including a woman were killed and 25 Jumma villagers wounded in this attack. It is learnt that around 200 houses of Jumma villagers including 3 Buddhist temples and a church were completely burnt into ashes. We urged to intervention of the UN High Commissioner for Human Rights, Ms Navi Pillay with the government of Bangladesh for taking appropriate actions against the burning down of the indigenous Jumma villages and indiscriminate killing of indigenous Jumma peoples since yesterday night i.e. 19th February 2010 by the Bangladesh Army and illegal Bengali Muslim settlers. According to the information received by us this morning, the Bangladesh Army has resumed the burning down of the tribal houses at 6 am GMT (20 February 2010) and the villages are still being burnt at the time of issuing this press release. 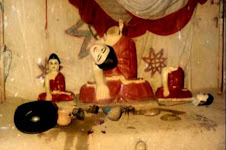 At least three innocent Jumma including Lakkhi Bijoy Chakma and Litan Chakma were shot dead this morning (20 February 2010), dozens were injured in the firing by the Bangladesh Army while one Buddhist monk, Purnabash Bhikkhu, has been missing after the Buddhist temple was burnt down. At least four indigenous/tribal villages - Gangaram Doar, Retkaba, Purba Para and Guchachagram - under Sajek Sub-Division of the Chittagong Hill Tracts of Bangladesh have been burnt into ashes. In addition, at least 7 shops in Ladumani bazaar, one UNDP sponsored village centre providing assistance to the indigenous villagers, one church and 3 Buddhist temples were burnt down yesterday night (19 February 2010). 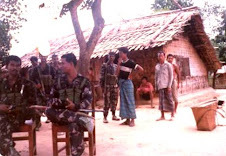 Since the beginning of January 2010, illegal plain Bengali Muslim settlers with the support of Bangladesh army personnel posted at Baghaihat zone under Rangamati district resumed expansion of their illegal settlement into the villages of the Chakma people. A number of houses have already been erected by the illegal plain settlers by forcibly occupying indigenius Jumma villagers’ lands. The Jumma villagers under the banner of Sajek Bhumi Rakkha Committee (Sajek Land Rights Protection Committee) submitted a memorandum to the Baghaichhari Upazila Nirbahi Officer on 10 January 2010 with an ultimatum of 16 January 2010 to return them their lands. As the deadline expired without any fruitful result on 16 January 2010, Jumma villagers started their agitation and started to boycott Baghaihat market from 18 January 2010. The Bangladesh Army personnel and the security forces started burning down the indigenous Jumma villages since yesterday night to increase settlement of illegal plain settlers. 1. To immediately declare a roadmap for full and comprehensive implementation of the 1997 CHT Accord, in line with the government's election pledge. 5. Appointment of indigenous people in all posts under the CHT local government system. 6. Constitutional assurance for the future safeguard of indigenous people and non-repetition. 7. Establishment of international Human Rights Camp in CHTs. The CHT Commission (“CHTC”) congratulates the Awami League‐led government on completing a year in office. At our last meeting with Prime Minister Sheikh Hasina on August 17, 2009, members of the Commission were heartened when she reasserted her personal commitment to overseeing the implementation of the CT Accord in the span of her government’s current five‐year tenure of office. We have learned, however, that the Parliamentary Standing Committee (PSC) of the Planning Ministry decided, on 23 December 2009, to develop tourism in the CHT region, contrary to the CHT Accord since the Hill District Council (HDC) was not present and had not been consulted. The PSC met, irregularly, under the CHT Development Board in Rangamati with Committee Chairman Col (retd) Oli Ahmed in the chair. To facilitate tourism, the PSC also resolved to build a road along the bank of the Kaptai Lake and to set up various recreational facilities as part f this project. The road would be connected with Bandarban, Khagrachari and Chittagong district. There have also been reports in the media that the upazila administration in Bandarban is illegally grabbing land belonging to arma and Bawm communities in the name of tourism development centres (“Allegations of tourism development on Adibashi land in Bandarban” ‐‐Daily Prothom Alo, 24 December 2009; “Adibashis aggrieved at the building of ‘Shorgochura’ tourism centre in Bandarban municipal area” ‐‐Daily Purbokon, 3 January 2010). 40 acres of land have allegedly been marked off with red flags by surveyors to build the tourist spots. are therefore in direct violation of the Peace Accord as the HDCs have not been involved in either the planning or the implemenation of these projects. The CHTC is also not aware of any studies that have been carried out to assess the environmental impact of the proposed growth f tourism industry in the CHT. We respectfully suggest that expert consultants be invited to assess the sustainability and potential impact of large‐scale tourism on land and water resources. The potential for tourism needs to be linked to other developments in the region in a single comprehensive plan, in the formulation of which democratically elected HDCs should be fully involved. Madam Prime Minister, the Government of Bangladesh, under your leadership, took a key role at the Copenhagen Climate Change talks. As was discussed at those talks, the world has seen untold environmental damage due to unplanned industrialization and development. Bangladesh is particularly vulnerable to climate change and related environmental damage. Preserving the extremely fragile and precious environment of the Chittagong Hill Tracts is therefore a priority. d) preventing further illegal land grabbing from indigenous communities in the name of development. The CHT Commission strongly believes that implementation of the CHT Accord is a must for strengthening democratic good governane, ensuring a people‐oriented and environmentally‐friendly development and rule of law in CHT. The government should immediately declare a roadmap to fully implement the CHT Accord within its present tenure. 1. Syeda Sajeda Chowdhury, Honorable Deputy Leader of the House & Chairperson of the National Committee for Implementation of the CHT Peace Accord. 2. Dr. Dipu Moni, Honourable Minister, Foreign Ministry, Government of the People’s Republic of Bangladesh, Dhaka. 3. Barrister Shafique Ahmed, Honourable Minister, Law, Justice and Parliamentary Ministry, Government of the People’s Republic of Bangladesh, Bangladesh Secretariat, Dhaka. 4. Mr. Syed Ashraful Islam, Honourable Minister, Local Government, Rural Development and Cooperative Ministry, Government of the People’s Republic of Bangladesh, Bangladesh Secretariat, Dhaka. 5. Mr. Rezaul Karim Hira, Honourable Minister, Ministry of Land, Government of the People’s Republic of Bangladesh, Bangladesh Secretariat, Dhaka. 6. Mr. Dipankar Talukdar MP, Honourable State Minister, Ministry of CHT Affairs, Government of the People’s Republic of Bangladesh, Bangladesh Secretariat, Dhaka. 7. Mr. Hasan Mahmud, Honourable State Minister, Ministry of Forest and Environment, Government of the People’s Republic of Bangladesh, Bangladesh Secretariat, Dhaka. 8. Mr. Jyotirindra Bodhipriya Larma, Chairman, CHT Regional Council, Rangamati. 9. Mr. Promod Mankin, Honourable State Minister, Ministry of Cultural Affairs. 10. Mohammad Shah Alam, MP and Chairman, Parliamentary Standing Committee on CHT Affairs, Jatiya Sangsad Bhaban, Dhaka. 11. Mr. Jatindra Lal Tripura, MP and Chairman, Task Force on Rehabilitation of Returnee Refugees and IDPs, Khagrachari. 12. Mr. Bir Bahadur, MP and Chairman, CHT Development Board, Rangamati. 13. Justice Khademul Islam Chowdhury, Chairperson, CHT Land Commission.